Interview: "Our consumer is looking for the deal – and does not care about the piece being last season"
„It is a small step for retail, but a giant step for HBC.“ There was pathos in the words of Wayne Drummond, President Saks Off 5th Europe, at the inauguration of the Premium Off Flagship in Düsseldorf. The opening took place at the former department store Carsch-Haus on Wednesday, 7th of June. 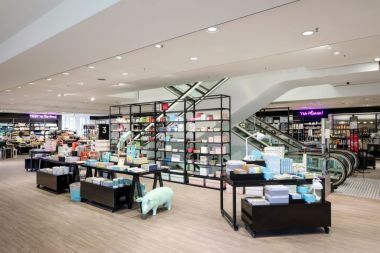 Exclusive brands at marked down prices in the city center – the concept off Saks Off 5th which belongs to the European daughter of Canada-based Hudson’s Bay Company (HBC) is the first of its kind in Europe. We talked to Wayne Drummond, at HBC since 28 years, about competition, cannibalism and his expectations for the next 12 months. Mister Drummond, we see a big range of products here on five floors. Where do you get the items you sell? Almost all of our items are from our relationships with brands and partners. We purchase nothing from our parent company in the U.S. Our brand mix is really tailored to the European market. Is the range of products fix or will it change? The beauty of our concept is: The consumer is the boss and will tell us what he or she wants. Fortunately we can set up new items quite easily. We positioned ourselves where we think the opportunities are most obvious, but are completely open to learn from our customers. Saks Off 5th is situated very close to the new Galeria Kaufhof. Across the street you see full prices, here you have half prices. Do the two concepts cannibalize each other? No, we don’t believe so. First thing: our brand overlap is quite small. "Off price" is a particular shopping channel – and a department store is a different and unique shopping channel. There you have propositions we cannot offer here: the full brand experience, for example. When we partner up with someone, wether it is with brands or with a competitor, we want traffic and everyone has the opportunity to take part. Our consumer is looking for the deal – and does not care about the piece being last season. So they are not replacing, but adding items to their purchase. We focus rather on a mentality than on the age of our consumer. Everybody wants to be thirty – and we all are! (laughs) We see everyone to find a treasure at Saks Off 5th, but to put a frame around it: We target a 30- to 50-year-old audience of fashion inspired, style aware people. Although we are also attracted by a younger consumer who loves brands but is maybe not quite able to buy them at full prize. What do you expect for the first year in terms of turnover? We are very sure that we are going to reenergize the shopping center areas that we are in. Every retailer today is searching for the traffic and we want to revitalize the whole market.